Thanks to the state of the economy we are all inundated with recession specials and discount pricing. In fact, many of us are loathe to buy something that ISN’T on sale. 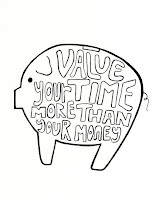 However, a new study from Stanford Business School entitled “The Time vs. Money Effect” learns that pitches that focus on the value of time are far attractive, enticing, and appealing than those that focus on money. The study, detail in the Wall Street Journal Article, Why Tie Marketing to Time Not Money, also seems to indicate that even post-purchase, consumers report about their belongings more favorably when prompted to consider their time and experience with the item rather than the value or monetary investment associated. This finding certainly seems worth taking into account when rethinking your marketing messages, pitch language, and promotions! (photo courtesy of bluebicicletta's etsy shop). The PixelHotel is a business that has really turned convention on its head! We originally read about this on SpringWise and have been thinking about it ever since. Instead of offering a centralized hotel location, this Austrian hotel decided to use small affiliate locations all around the city that were as varied as their location. Some are simple apartments, small cottages or houses, while others are even workshops or gallery spaces! This approach yields more interesting abodes and embeds visitors in various sections of the city, encouraging a very different tourist experience. The limited amenities keep the price down and the lack of room service redirects those dollars into the local economy! It is not so often that you read about a business that distinguishes itself by defying the most basic assumption about their own business. * How can you make use of space differently? * How can you embed your product or service into another experience? * What fundamental principle of your industry or business is worth questioning or flipping around? We have become familiar with companies touting their local-ness and their carbon footprint (either for the entire organization or even for an item for sale in the case of Patagonia's FootPrint Chronicles), and now it seems that many “grass-roots” or “hand-made” companies are now touting their ‘trace-back factor’, allowing for a greater level of production transparency and the opportunity for consumers to connect more with their products. 1. 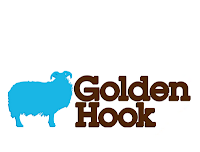 Golden Hook gives you an opportunity to not only design your own wool or bamboo hat, but also to choose the granny that will make it for you. 2. Icebreaker, a New Zealand company, created the BaaCode, which allows you to trace your garment back to the specific sheep that helped to create it. 3. Similarly the Beerenberg Jam Company created the Provenance Pathway, which allows you to trace your jam back to the strawberry field from which it came. You can see who cooked the jam, how it was made, and where the other ingredients came from! We are curious about how these features have changed these companies relationships with their customers. * How could you employ some element of transparency or trace back in your company or service? * What if you are a service company? * How would you share that information with your customers? Reply For All & Put Those Emails to Good Use!! Feels like you send a lot of emails, right? Did you ever think, “I wish all these emails could actually be used for good”? No? Well someone did! Reply for All makes it really easy to do some good and generate some money for your favorite cause by including a cause related signature in your gmail, aol, or hotmail email accounts. Here is how it works: you select your cause from 8 possible choices (including things such as ‘find a cure for cancer’ to ‘defend animal rights’ to ‘stop global warming’), select whether or not you want a rotating fact adjoining the cause symbol and enter your email. Larger companies pay to attach their logo to various causes and those fees are donated to the cause you have selected. It is that simple. Your emails will then include a “signature” that looks like this at the bottom and you get to just email as you normally would. What is REALLY cool is that you can see the accumulated impact of your generous email traffic in your account. For example, it may say: You have helped 11.5 persons from the effects of poverty. AND you can change your cause as often as you want; your own flavor of the month club! Reply For All also tracks and reports the collective impact of Reply For All users, so you can feel in good company in your actions, and ponder just how many gazillions of emails it took to create that amount of impact!! The value of a network specifically for women? We conceived of in good company workplaces based on a need that we had identified among our consulting practice clients (women entrepreneurs). We found that they experienced many degrees of isolation while forming and running a business - physical, mental, emotional, and in some ways spiritual. Truly unable to find an existing solution, we extended our business and sought to offer an answer to this isolation problem by providing a comprehensive place where these women were able to work, meet, and learn together (- hence our tag line "work.meet.learn"). In some ways IGC was born because "necessity is often the mother of invention", but we also did a lot of research to validate our thinking. We continued to focus on women because that was “our niche” and because we knew that all these challenges rang true for them. The truth is, we connected to so many women that shared this experience and validated this need, that we didn't feel it was necessary to expand the concept to men. So, in short, the answer to all of the very valid questions is that it's entirely possible that men have many or all of these needs too, but we choose to cater to women because they are the customer we know! Now on to the question of the value of a women only community.... We strongly believe that it is important to connect to communities that are relevant and valuable to you and your business. Some of you may find that means connecting to several communities, while others may find that there is one community that meets all of your needs. Birds of a feather flock together, so our advice is to know what kind of bird you are, and then find your flock! With the help of IGC Member Joan Reilly, IGC is hosting a clothing drive run by Wearable Collections, which is a VERY cool non-profit who is bothered by the fact that every year 386 million pounds of perfectly good but unwanted clothing and textiles enter the NYC waste stream, making up about 6% of the total waste in New York City. This is a win-win-win-win initiative. You can get rid of things that you don't need and want, wearable collections distributes the clothes to people in need around the world, the city benefits from less waste in the waste stream, AND the proceeds are donated to another very deserving charitable cause! whew - I mean, is that all?! So far, this relatively new organization has diverted nearly 1Million pounds of clothing from landfills. Help them! IGC Members have until May 15th to participate by bringing their unwanted clothes& textiles to the office. Others can either start an initiative in their own building (WC is co-op approved) or visit one of the drop off centers. I wish I could say that this was IGC's planned Earth Day initiative, but truly all the credit goes to Joan! So for more questions about the partnership (or for help actually deciding what items to donate and what items to keep or repurpose!) contact Joan Reilly - lifeofreillyorganizers@verizon.net. The latest issue of Inc magazine pays tribute to its 30 year anniversary with a few lists of 30 items. One “Don’t You Wish You Thought of That? : America’s Weirdest Businesses” is particularly amusing and, as it promises, it profiles business ideas that seem at the outset outright bizarre. The list ranges from drive-thru strip joints to prosthetic testicles for neutered dogs to narcotic-detection dogs for sniffing out teens’ rooms to Sarah’s Smash Shack (a business we have written about before) which offers catharsis through china & glass destruction in a safe environment. (This list actually came in handy during my stint at jury duty this week by keeping several of us entertained during one of our deliberation breaks – Thanks Inc.!). Reading through this made me laugh imagining how all these business ideas were concocted. Did each one start as only a half-serious idea in the founder’s mind? I also wondered how many discouraging remarks each founder had to endure throughout their start up process. And what are their 15 second pitches like? What are the founder’s professional backgrounds like? And isn’t it funny that even if the business itself is outrageous that the founders still need to worry about mundane business tasks like accounting and customer communications and inventory? At the end of my musing, I realized that no matter how unorthodox and unexpected, I probably still have a lot in common with these business owners, or at least we’d have a lot to talk about (perhaps unlike my fellow jury members). Another list that I love, of course, is the Business Owners Book Shelf. I was excited to realize that I own or have read many of these books (obviously these are not always synonymous! )...including of course my favorite Small Giants . Perhaps this is good fodder for our entrepreneur book club? We will have to see! Shout Out from Time Out! In last week's "Make Money/ Save Money" edition of Time Out New York, In Good Company was listed alongside some great "shared space" peers in an article entitled Your Office Away From Home, including Brooklyn's 3rd Ward & Brooklyn Creative League and Manhattan's Rose Tech Venture Incubator and, of course, our favorite Paragraph! We are so glad to be recognized as key resource for the self-employed! Thanks to Jodi Glickman of Great On the Job for modeling! See Erin Rock - BabyCakes CookBook Commercial! Erin McKenna rocks. And now you can watch her rock. Seriously, you can. 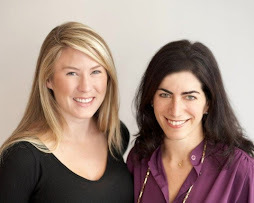 As you may remember, we hosted Erin, of BabyCakes NYC, for one of our In Good Company Conversations back in October. During our conversation she talked about her upcoming eponymously named BabyCakes Cookbook, which hits stores on May 5th. In anticipation, Erin created just about the most rockin' cookbook commercial you could ever imagine! Check it out. This girl is cooking and making moves. Entrepreneurs take note - this is a small business owner to continue watching! In the last Mom/Business Owner Affinity Group we discussed how much information is too much information when you run your own business and have family responsibilities. While this discussion was a long overdue, it was well received as there seems to be blurred boundaries on what is appropriate. As a mother and a business owner, I have found it odd when a woman who I do not know well at all has scheduled an appointment only to tell me at the last minute that she cannot find a babysitter and she cannot make it. I completely understand this predicament; however, sometimes I find it strange that the information is shared. From my perspective, she needs to cancel or reschedule the meeting but to me the reason is irrelevant. She is a professional and I give her the benefit of the doubt that she makes decisions that work for her and her business. I know, STICKY subject! I am sure for some of you, the hair on your neck just raised. * When might it be detrimental to share too much personal information? Could you alienate someone? Make them feel uncomfortable? Put yourself at a disadvantage? * When might sharing personal information strengthen a professional relationship? My own perspective is that you do not need to apologize for having a family and a business. Rely on the fact that you make the best decisions you can based on your priorities and just set realistic expectations for your clients, customers and yourself! I have noticed that there are a log of things that we do in our business because that is "the way we have always done it" read: routine. I challenged myself to examine my routines and determine if how I was doing it "the way I always did it" was effective or could I figure out at better way to do that activity. A highlight of my findings: I highlight emails in my inbox to be in the marked as unread status when I need to deal with something but do not want to deal with it at the moment. I found that I re-read and highlight and unhighlight the item approx 10 times before I deal with the issue at hand. I procrastinate - there I said it. Wow! What a total waste of time! I have decided to allow my self to mark as unread 1x and then each day I need to allocate 30 minutes to go through all of the alleged "unread" messages and deal with them. I challenge you to think of something you do in your business out of routine and see if there is a way you can do it differently and ultimately more effectively. Being a creator of comfort can lead to stagnation and impede your ability to innovate. Get uncomfortable and get out of your own way!